Self-Portrait has a way of creating the perfect party dresses – This red sheer floral lace style reveals just the right amount of skin, with skinny straps, an open back and a midi skirt. A lining stops to reveal the legs beneath. Self-Portrait’s Hall red mini dress makes a statement in contemporary evening wear. The raspberry-red fabric sculpts to your figure, while panels of sheer lace and tulle and ruffled trims at the shoulders add an additional touch of texture. Crafted from a lustrous taffeta and fully lined for comfort. This sensational take on a classic fit and flare silhouette is cut to a sleeveless shape, with an elegant scooped neckline. Landing at a midi-length, with asymmetric tiers to the full skirt for a voluminous finish. Team with heels and a clutch for a showstopping occasion ensemble. Hire this red ankle length dress by Virgos Lounge. Long sleeves and beaded – this is a stunning choice which will draw compliments all evening. The perfect length for comfortable dancing. Does your Chinese New Year celebrations involve a black tie event? Then the red ‘Painted Lady’ is a beautiful full length evening gown to hire. It is one of Beulah’s classic styles that exudes elegance and glamour. Perfectly matched with skyscraper heels and minimal accessories, this floor length piece is complimented by a thigh high slit and pleated neckline. 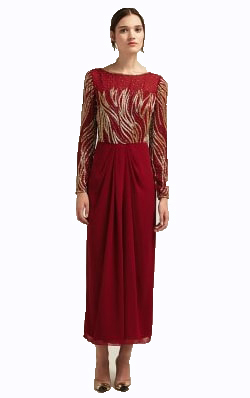 Renting this red full length evening gown is sure to set the tone for your Chinese New Year celebrations. Tags: GMD Daily. ADRIANNA PAPELL, Adrianna Papell dress, ADRIANNA PAPELL dresses, ball dress, Ball gowns, beulah, Beulah Dress, Beulah dresses, Black cocktail dress for rent, Chinese New Year gowns, Chinese New Year Outfit, CNY Oufit, cocktail dresses, designer dress hire, Dress Hire, dress of the week, Evening Dresses, Girl Meets Dress, GMD, hire a dress, hire adrianna papell, Hire ADRIANNA PAPELL Dress, Hire Adrianna Papell dresses, hire beulah, Hire Beulah Dress, Hire Beulah Dresses, hire celebrity dresses, hire cocktail dresses, hire designer dresses, Hire dresses, Hire Red Dresses, hire red dresses london, hire red dresses uk, hire self portrait, Hire Self Portrait dress, hire self portrait dresses, Hire Virgos Lounge, Hire Virgos Lounge Dress, Hire Virgos Lounge Dresses, long dresses, party dress, party dresses, party dresses uk, rent a dress, rent ADRIANNA PAPELL, Rent ADRIANNA PAPELL dress, Rent Adrianna Papell dresses, rent beulah, Rent Beulah Dress, Rent Beulah Dresses, rent celebrity dresses, Rent designer dresses, rent dresses, rent red dresses london, rent self portrait, Rent Self Portrait dress, rent self portrait dresses, Rent Virgos Lounge, Rent Virgos Lounge Dress, Rent Virgos Lounge Dresses, Self Portrait, Self Portrait Dress, self portrait dresses, short dresses, Virgos Lounge, Virgos Lounge dress, Virgos Lounge dresses, what to wear, What to wear for Chinese New Year?. Valentine’s Day Dresses for Chic by Choice Customers! So Valentine’s Day is just under a week away and if you want to rent a dress for your special day from Chic by Choice, unfortunately they’ve closed down, but don’t worry as Girl Meets Dress is here for your special day. We’ve composed a list of our favourite dresses for you to hire, to impress your special someone. This black midi dress by Gorgeous Couture is a cleverly constructed design. Be bold with the cut out off the shoulder style. This red floral midi dress by Self-Portrait is the perfect Valentine’s dress – This red sheer floral lace style reveals just the right amount of skin, with skinny straps, an open back and a midi skirt. A lining stops to reveal the legs beneath. Chic by Choice did used to hire out dresses from Self Portrait. This burnt orange dress is perfect if you are coming straight from the office to celebrate with your loved one. This is dress is by British designer AMANDA WAKELEY. This is such a failsafe dress, and flattering for every figure. With the body-sculpting scuba fabric, the waist-defining peplum and stylish short sleeves. Dress by British designer AMANDA WAKELEY. This gorgeous scuba gown with fringing on the pockets is the most stunning dress you could wear, when you need to make an impression! The cut is extremely flattering and it is our favourite black fishtail gown of the season! This white dress for hire is by PLEIN SUD. The perfect brand for occasion wear. Team with heels and a clutch. Weddings, Birthdays, Dinner – this is a dress for turning heads but comfortable and classic at the same time! As a former Chic by Choice customer, I am sure you know that they were based in London and for those who lived in London, Girl Meets Dress offer same day delivery, for all orders placed before 1pm, so its not too late to hire dresses of your dreams! Tags: GMD Daily. amanda wakeley, AMANDA WAKELEY dress, Amanda Wakeley Dresses, can i still hire from Chic by Choice?, can I still rent from Chic by Choice?, Chic by Choice, Chic by Choice address, Chic by Choice closed, Chic by Choice consumer, Chic by Choice customers, Chic by Choice dress, Chic by Choice dresses, Chic by Choice order, Chic by Choice review, Chic by Choice reviews, Chic by Choice showroom, Chic by Choice shut down, designer dress hire, Designer dresses, did Chic by Choice close?, did Chic by Choice shut down?, Dress Hire, Girl Meets Dress, GMD, Gorgeous Couture, Gorgeous Couture dress, Gorgeous Couture Dresses, hire a dress, hire AMANDA WAKELEY, hire AMANDA WAKELEY dress, hire Amanda Wakeley dresses, hire celebrity dresses, hire cocktail dresses, Hire dresses, hire gorgeous couture, hire gorgeous couture dress, Hire Gorgeous Couture Dresses, hire Plein Sud, hire Plein Sud dress, hire Plein Sud dresses, hire self portrait, Hire Self Portrait dress, hire self portrait dresses, how to hire from Chic by Choice?, how to rent from Chic by Choice?, is Chic by Choice in London?, is Chic by Choice open?, is Chic by Choice still open?, party dresses uk, Plein Sud, Plein Sud dress, Plein Sud dresses, rent a dress, rent amanda wakeley, rent AMANDA WAKELEY dress, rent amanda wakeley dresses, rent celebrity dresses, Rent designer dresses, rent dresses, rent gorgeous couture, rent Gorgeous Couture dress, Rent Gorgeous Couture Dresses, rent Plein Sud, rent Plein Sud dress, rent Plein Sud dresses, rent self portrait, Rent Self Portrait dress, rent self portrait dresses, Self Portrait, Self Portrait Dress, self portrait dresses, What to wear for Valentines Day, where is Chic by Choice's showroom?. Many of you have been in touch with us – asking us to fix your dress hire fashion emergencies and arrange last minute dresses for your events. If any of you have been left with unfulfilled dress hire orders following the closure of Chic by Choice, below are all our contact details so please don’t hesitate to get in touch, either if your order was not delivered by Chic by Choice, or you were about to order and have an event soon. We also have a GIRL MEETS DRESS LONDON SHOWROOM where you can pop in and try on all the dresses. Tags: GMD Daily. can i still hire from Chic by Choice?, can I still rent from Chic by Choice?, Chic by Choice, Chic by Choice address, Chic by Choice closed, Chic by Choice consumer, Chic by Choice customers, Chic by Choice dress, Chic by Choice dresses, Chic by Choice order, Chic by Choice review, Chic by Choice reviews, Chic by Choice showroom, Chic by Choice shut down, designer dress hire, Designer dresses, did Chic by Choice close?, did Chic by Choice shut down?, Dress Hire, Girl Meets Dress, GMD, hire a dress, hire celebrity dresses, hire cocktail dresses, Hire dresses, how to hire from Chic by Choice?, how to rent from Chic by Choice?, is Chic by Choice in London?, is Chic by Choice open?, is Chic by Choice still open?, party dresses uk, rent a dress, rent celebrity dresses, Rent designer dresses, rent dresses, where is Chic by Choice's showroom?. Starting to think about what to wear to prom? Well, look no further! Here at Girl Meets Dress, we have over 4,000 dresses for you to choose from! Have a browse through our ‘prom dress’ section where you will see many dresses for hire from all your favourite designers! This blog will feature our 4 top picks for prom dresses to hire in Liverpool! A romantic, flowing chiffon gown to hire with a hint of skin and lace trim inserts by Jill Jill Stuart. We love this blue keyhole front opening gown which you could hire for Prom. Heavily beaded and in a wonderful navy blue colour, you will feel ready to party when you hire this gown. This is a feminine and pretty ruffle gown, in pale purple shade. Worn by Camilla Thurlow from Love Island to the 2018 NTA Awards. Hire this gown for Prom. LA label For Love and Lemons is one of our favourite brands for pretty, printed dresses – The Flora Maxi Dress by has a thigh high slit, and could be worn for a day or evening celebration all summer. Featuring a deep plunge neckline with a button and loop closure at the neckline to create an optional choker detail, a lace up design on the front, a hidden back zipper, fine silk material, and a glossy floral design. Tags: Features. Alice and Olivia, as seen on celebrities, Ascot dress rent, Ball dresses, ball gown rental, Ball gowns, best prom dress, Black cocktail dress for rent, Celebrities in Self Portrait, cocktail dress rental, designer dress hire, designer dress rent, designer dresses uk, Dress Hire, Girl Meets Dress, GMD, Gorgeous Couture dress, Herve Leger Bandage dresses, herve leger bodycon dresses, herve leger dress, hire a dress, Hire a Self Portrait Dress, hire alice and olivia dress, hire celebrity dresses, hire cocktail dresses, hire designer dresses, Hire dresses, Hire Gorgeous Couture Dresses, hire herve leger dress, Hire Jill Jill Stuart, Hire Jill Jill Stuart dress, Hire Jill Jill Stuart Dresses, Jill Jill Stuart, Jill Jill Stuart dress, Jill Jill Stuart Dresses, long dresses, party dresses uk, Prom, Prom dress, prom dress hire, prom dress hire bristol, prom dress hire liverpool, rent a dress, rent celebrity dresses, Rent designer dresses, rent dresses, Rent Jill Jill Stuart, Rent Jill Jill Stuart dress, Rent Jill Jill Stuart dresses, Rent Jill Jill Stuart Dresses in the UK, rent prom dress, rent prom dresses birmingham, rent Prom dresses in Newcastle, rent prom dresses leeds, rent prom dresses manchester, rent prom dresses online.